Dawn holds a Master of Music degree in vocal performance form the Cleveland Institute of Music and has sung professionally since 1996. Dawn has taught private voice lessons at Hartland Music since 1999. 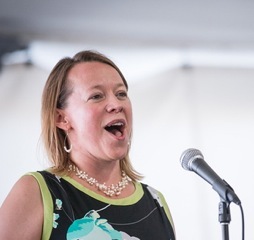 In that time, her students have performed roles with several regional companies including the Florentine Opera Company, the Milwaukee Rep., Waukesha Civic Theater, Sunset Playhouse, Theatre on Main, and the Lake Country Players. Several of her students have attained the prestigious Exemplary Soloist Award at WSMA state competition and honorable mention awards with the National Foundation for Advancement in the Arts. Dawn's students have gone on to receive music scholarships at many colleges and universities, such as Luther College, St. Olaf College, Roosevelt University, Viterbo University, and UW-Madison. Dawn has also managed a non-profit opera company, worked in music sales, and done educational outreach for several different opera companies. She recently attained certification to teach general and choral music from early childhood through adolescence. Dawn believes in inspiring and nurturing the natural potential of each individual voice.